rainbow retro glass christmas garland. looking for stylish holiday decor ideas with a vintage edge? our stunning glass christmas tree garland is fashioned from hand-crafted mercury glass in a breathtaking color composition that hints towards holiday decorations from yesteryear. 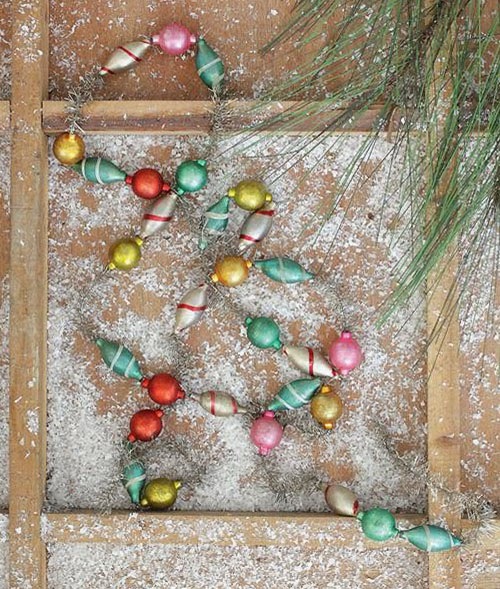 this mercury glass christmas garland adds an instant touch of sophistication and style to your holiday home. drape around the tree, hang from a wall or layer on holiday dining room tables for a festive display. use a single garland as an accent piece or purchase in multiples to complete your decor. fashioned from an attractive mix of glass ornament beads in complimenting color ranges such as silver, gold and aqua green. garland comes fully assembled as pictured and is ready to be used out of the box. measures about 6' (six feet) in length. can be combined with our pieces of our noel collection.